The sunshine isn't the only thing Calgary native Chris Merchant has been soaking up at Stampeders headquarters. Designated as the Stamps' USports development quarterback throughout this year's training camp, the current Western University player is taking full advantage of his brief glimpse at the professional level. "It's been awesome," beamed Merchant following the first practice on Day 2 at McMahon Stadium. "I just came out here trying to be a sponge and trying to learn everything. Obviously these guys have a lot more experience than me so I'm hoping the game, when I go back to Western, will slow down a little bit for me. I want to take some of the concepts that we're working on here and maybe help my team with those." Although Merchant will be the one and only collegiate player taking reps for the Red and White over the next few weeks, second-year Stamp Andrew Buckley was once extended the same invitation by the Stampeders while a member of the University of Calgary Dinos. "It's cool seeing Buckley and talking to him because he kind of did the same thing," the up-and-coming 21-year-old described. "Seeing how that helped him develop (is inspiring). This is the dream someday so it would be awesome to be out here actually competing for a job one day." Merchant, whose Mustangs offence operates under a much different style of playcalling, is also seeing the value of a contrary system to gain a new perspective from his position under centre. "At Western, we maybe run the ball a little bit more and this is more of a spread and we throw the ball and air it out," summarized the medical sciences major. "But obviously I can take a lot of this back and use whatever I learned here. I'm just learning as much as I can." The 6-foot-3, 214-lb. passer is coming off his first season with the purple and white after transferring from the NCAA's University of Buffalo Bulls. "Me being the quarterback, I have the highest expectations," Merchant stated when asked about returning to school. "Obviously I'm going to take my team as far as I can and I've got one goal in mind and that's the Vanier Cup. I'm hoping that our team can come together this fall and I think we're going to have a really good shot at it." His time in at Buffalo was preceded by high school playing days spilt between Calgary's Western Canada High School and St. Andrew's College, a boarding school located in Aurora, Ont. He has also been both a participant and coach at the annual youth passing academy hosted by Dave Dickenson. As a result of his son leaving home at a young age to pursue his passion for football, Merchant's father, Peter, has been getting a front-row seat to support his son now that he's been hitting the practice field with the Stamps. 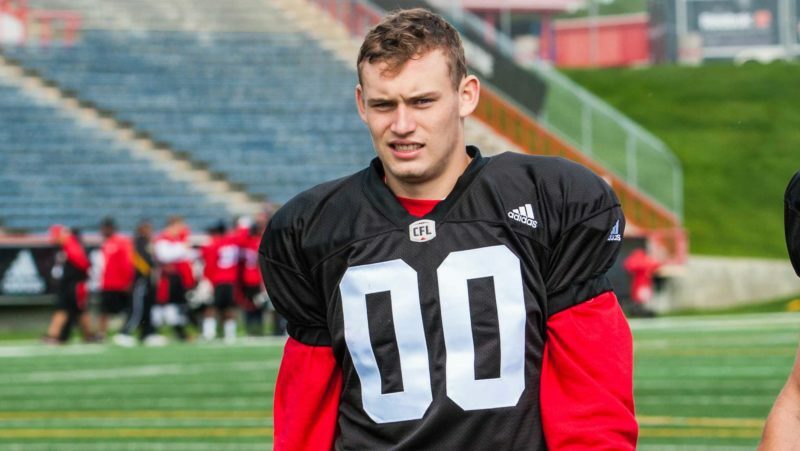 "He hasn't been able to watch me play a ton of football over the last couple years because I've been out east," explained the younger Merchant, who has three years of USports eligibility remaining and two seasons left before his 2019 draft year. "It's always a great thing to have him in the stands watching me and supporting me. I've always had my parents behind me and it's awesome."